Just as Black Friday nears, and HEAT programs across the country are reminding us to lock our cars and conceal our valuables while shopping for the holidays, NICB reveals one way to eliminate or at least reduce auto theft is simply to drive a Prius – the least stolen vehicle in the US. It would seem thieves just don’t get their kicks out of the little green hybrids that have sold 1.2 million units since the were introduced. Further, beyond the fact they are the least stolen, they are the most often recovered vehicles on occasions when they do get purloined. Perhaps those who steal a Prius are not professional thieves, but mere joy riders that realize the little cars just aren’t providing the thrill they were seeking. So they are just abandoned a few blocks from where first filched. In fact, the theft rate for the Toyota Prius is ridiculously lower than the average model. Only one of 606 Prii were taken from their owners by felons during the 2008 to 2010 model years. The average for all models during those years is one in 78. Of course we’d wager not many Smartfortwo cars get swiped either – just a guess, you understand. 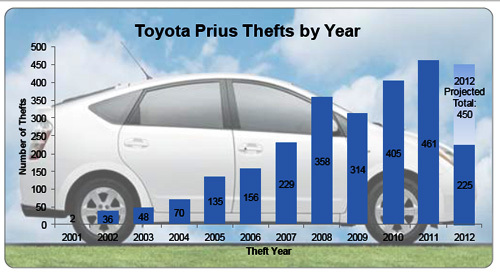 A grand total of 2,439 US Toyota Prii were reported stolen between Sept. 4, 2000 and June 30, 2012. They are gaining popularity with thieves, however it is a very slow process. However, this article might change the reality. If you’re fleeing prosecution do you have a better chance of making the state line at a breakneck pace in a SRT8 or moseying along in a Toyota Prius? Even a joy rider could figure that out – screenplay writers take note! The best thing about Toyota hybrids like the Prius, Camry Hybrid, etc. is that you can't hotwire the engine to get it started like you would a regular car-- the hybrid starts up by booting up the hybrid electrical system, without turning on the gasoline engine. The trim levels equipped with Toyota's SKS are darn near impossible to steal without the key fob, unless the car thief has a flatbed truck to haul the Prius away. There are actually plenty of valuable things In a Prius that a car thief can make money off of. The wheels are compatible with other Toyota cars like Corollas or Yaris. The 1NZ-FXE engine has plenty of identical parts as the 1NZ-FE engine in other Toyota cars like older Corollas, Yarises and Echos. Then there is the rare-earth-element-rich items like the neodymium magnets in the motors and lanthanum in the HV batteries that can fetch quite a sum for scrap dealers. I'd say the difficulty in stealing the Toyota Hybrids is probably the chief reason why they don't get stolen much.